Anyone who's into endurance running, fell running, trail running will have heard something about the Wainright Round. 214 fells in England's Lake District with 36,000m ascent over 515km is pretty epic in itself, now imagine running that in a specific time! In 1986 Joss Naylor a legend in fell running, set a new record of 7 days and 1 hour to cover all 214 fells. Fast forward 19 years and Steve Birkinshaw an endurance runner with a background in elite orienteering and endurance running made his attempt to break what was deemed a record impossible to break. Steve smashed the record covering the 214 fells, 515km and 36,000m of ascent in 6 days and 13 hours. That's just incredible! Now Steve has written a fantastic book There is no Map in Hell which opens by setting out how this man got into the world of fell running and the account of the amazing Wainright Round performance. His book goes on sale this week in the UK. A book which I didn't want to put down. The publisher invited Ultra Running Matelot to take part in Steve's Blog Tour which will be published on various blogs over 9 days. I feel really humbled to be able to publish Day 3 of the tour for There is no Map in Hell and I hope you enjoy it as much as I do. You can find the links and dates to the other blogs below. So here is Day 3's tour blog. Throughout the seven days of my Wainwright round, I went through some extreme physical and emotional highs and lows. This was exhausting, and my years of experience definitely helped immensely to prepare me for these radical ups and downs. 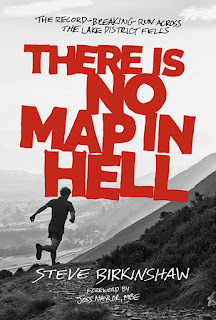 I was thinking about including my summary of the personal highs and lows in my book There is no Map in Hell, but chose not to. However I think it helps to demonstrate the intensity of the week, so I’m really pleased to have the opportunity to publish it on Owain’s blog. HIGH – Setting off on my epic journey with a small group of family and friends watching. HIGH – Climbing to the top of Latrigg – one Wainwright down 213 to go. LOW – Getting very hot on the tussocks around Armboth Fell. LOW – Climbing Glaramara whilst feeling dehydrated and tired. I have only been going for six hours. HIGH– A bit of rain on Allen Crags and I immediately feel a bit better. BIG LOW – Being violently sick towards the end of the first day and wondering if it is only going to get worse. BIG LOW – Lying down unable to sleep after the first day. HIGH – A lovely sunrise and then cooler cloudy day and I am feeling OK.
HIGH – On top of Scafell Pike (25% done!) and no injuries or blisters. LOW – My first blister approaching Hard Knott Pass. HIGH – The toughest, highest rockiest sections completed. Better running from now on. LOW – The midges at the Duddow, the worst I have known in England. BIG LOW – Four more hours' lying down unable to sleep as my knees throb with extreme pain. HIGH – A lovely morning over the Coniston Fells. LOW – The tracker shows we have missed Dow Crag and my wife (Emma) rings us up at 6am to see what has happened. HIGH –We can confirm to Emma that the tracker is wrong and we went the correct way. HIGH – A hot shower at the Great Langdale Bunkhouse. LOW – The section to Silver Howe seems to take forever and the climb to Loughrigg is extremely hot. BIG LOW – More lying down unable to sleep, until I finally drift off after some physio from Phil Davies. HIGH – A night section over Fairfield which is nice and cool. HIGH – Red Screes … the half way point! LOW – Tendonitis at the front of my ankle in my right leg. LOW – A hot day and feeling shattered as I climb out of Kentmere. LOW – In agony from my blisters as we approach High Street. HIGH – My support team manage to drain the blisters and I start to move better again. HIGH – Finally reach Howtown after nearly twenty-four hours on my feet. HIGH – Finally I get a good four hours sleep. BIG LOW – My blisters and tendonitis are really sore. I walk up Hallin Fell without shoes on and come down very slowly. I begin to doubt if I can achieve this. HIGH – Climb The Nab really strongly and I can manage to jog downhill on rocky paths. HIGH – Two hot showers and houses as support points during the day. LOW – Extremely hot and draining as we climb out of Glenridding. HIGH – Lots of people out to see me including a family with children of a similar age to mine. HIGH – Clough Head (three-quarters complete!) and a nice view of my house. BIG LOW – The steep descent off of Great Mell Fell is agony on my tendonitis. HIGH – Another good four hours sleep. BIG LOW – More agonising treatment on my blisters and then I hobble out of the campervan barely able to walk. HIGH – I climb strongly up Souther Fell and I am moving better again. LOW – I start to feel sick and bloated again. I take it easy and don’t eat or drink much for a while. HIGH – Emma comes with me up Carrock Fell. HIGH – Loads of people come out to see me over the northern fells. There is an England flag up for me at Longlands Fell and I am given an ice cream at Lonscale Fell. LOW – I go through a really tired spell and need a five-minute power nap on the summit of Great Cockup. LOW – If I place my foot down slightly twisted I scream in agony as the shoe presses on my blister. HIGH – My supporters find a nice route off Ullock Pike avoiding the rough descent. LOW – I try to hide from my children how painful the blister treatment is. LOW– The road out and back to Binsey is as horrible as I expect and I am unable to run much as I am feeling sick and tired. BIG LOW – My whole body feels like it is gradually disintegrating. I have a bad cough, I feel sick most of the time, I am struggling to hold a conversation and concentrate for more than short periods at any time. The end is in sight but I am still doubting that I can make it. HIGH – Another good four hours’ sleep. BIG LOW – Wake up feeling awful and burst into tears at the thought of running all day on painful blisters. HIGH – We make holes in my shoes to relieve the pressure on my blisters. HIGH – I am still climbing strongly. LOW – Descents are still extremely painful. BIG HIGH – it gets to 4 p.m. and people start appearing from all directions to join me. BIG HIGH – A brilliant atmosphere as I arrive at Newlands. BIG HIGH – Loads of people on the last leg with me, many of whom have helped me on the way around. BIG HIGH – Even more people are waiting on my final peak, Cat Bells. The book is a great read a surely must be on a runners wish list. If you liked this blog, please visit the other blogs listed above and enjoy.